Ancient and modern China formed an intriguing focus of study for 21 middle school students during their recent visit to the World Foreign Language Middle School (WFLMS), Harker’s sister school in Shanghai. At the end of March, 16 seventh graders and five eighth graders united for an action-packed week with their WFLMS buddies, who had earlier in the school year spent time at Harker as part of an annual reciprocal student exchange program. Journeying to China is a much-anticipated adventure and highlight of the middle school experience for many grade 7 and 8 students. While there, the Harker contingent visited numerous landmarks and historic sites. Originally based around the grade 8 computer science class’ global issues forum, the annual China trip expanded two years ago to incorporate the grade 7 historical component of learning about ancient China. Keith Hirota, grade 6 ancient civilizations teacher, headed this year’s trip. Carol Green, Harker’s middle and upper school communication studies department chair, who was already in China serving as an exchange teacher at WFLMS, joined the group as a chaperone. After a smooth flight, the students were warmly welcomed at Pudong International Airport by their pals from WFLMS, Hirota recalled. From there, they hopped on a WFLMS bus for the short drive into the city to meet their host families. “The students were greeted by WFLMS computer teacher Jack Sheng (who speaks fluent English with an Aussie accent), who sent them around campus on a fun orientation/scavenger hunt,” shared Hirota. After that, the Harker students participated in a dance class, followed by a class on the history, culture and food of China. The students also attended a class on Chinese geography that highlighted the Shanghai area. At the conclusion of the lesson, they headed to the auditorium, where they shared information about their American culture with the WFLMS student body. “They each did a great job talking about Harker clubs, after-school activities, spirit events and houses, speech and debate, special classes and electives, middle school sports, lunch and snacks, American holidays, famous American points of interest, video gaming and social media,” Hirota observed. The Harker students then hopped on a bus and headed for Zhujiajiao. The word Zhujiajiao means “Zhu Family Settlement.” It is one of six ancient water villages on the outskirts of Shanghai. With a population of 60,000, it features 36 stone bridges and thousands of ancient buildings along the riverbanks. After a boat ride through the canal, the students were given time to explore and bargain hunt throughout the hundreds of food and novelty shops in the area. “We had a 12-course family style lunch with a scenic view overlooking the canal and shops. After lunch, students were given more time to explore and shop. We drove back to Shanghai and had an early dinner at Da Niang Dumplings. Before heading off to ‘Era’ (the Shanghai Circus), the students had some time to buy desert and snacks at a few local shops. After a brief drive through the city, we arrived at the circus venue and our students were met by their WFLMS buddies. The circus was simply amazing and the highlight of the day!” reported Hirota. 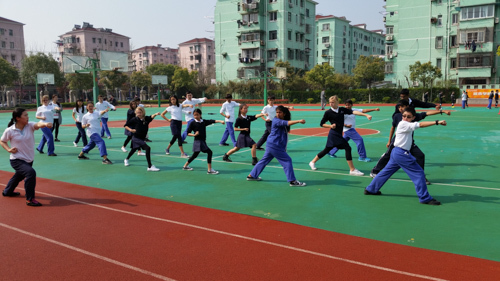 The students’ subsequent time at WFLMS included learning a form of ancient Kung Fu called Wushu and how to play Chinese instruments called the erhu and pipa. They also had fun making Chinese opera masks to take home. Another highlight for the Harker students was taking a rickshaw tour of Beijing, which included a moving visit to Tiananmen Square, site of the 1989 protests and ensuing military action. From there the group headed to the Forbidden City, where they were guided through several of its 980 palatial buildings. Then came a memorable visit to the Great Wall of China. After taking a ski lift to the top of the mountain, the group entered the wall. Students took many photos of the renowned structure and enjoyed a toboggan ride back down the mountain. The students’ time at WFLMS ended with a farewell ceremony and dinner. “The ceremony was bittersweet as we watched several students from both schools give touching speeches and performances,” recalled Hirota, noting that Harker students and their WFLMS buddies had been faithfully corresponding since the fall. Reflecting on the trip, grade 7 student Jatin Kohli said he really enjoyed the homestay with his buddy and the time they spent walking along the Huangpu River and the Bund, a famous waterfront area. “I wish our buddies could have joined us on our trip north to Beijing. The trip felt too short and I wish I had more time,” he said.